Nikki Haley was exceedingly blunt at the United Nations this morning. She said that the Security Council must impose the strongest possible sanctions against North Korea. This is obviously in response to the testing of a hydrogen bomb this weekend by North Korea. It is also being called for because the Hermit Kingdom flew an ICBM over Japan causing millions of Japanese to run for shelter. 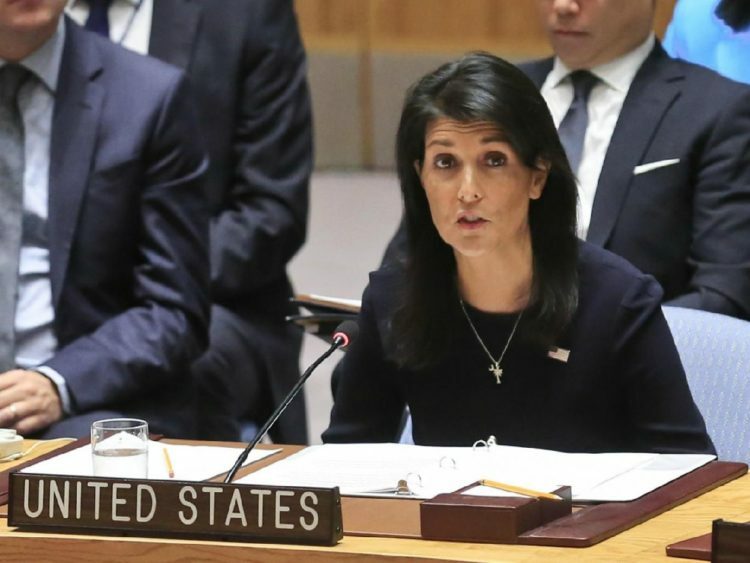 “To the members of the security council, I must say, enough is enough,” Haley said at an emergency session of the UN Security Council in New York. “We have taken an incremental approach, and despite the best of intentions, it has not worked. We have engaged in numerous, direct and multilateral talks with the North Korean regime, and time after time, they have not worked,” she said. “The time for half measures in the Security Council is over,” she said. “The time has come to exhaust all of our diplomatic means before it’s too late.” I hate to break it to her, but it’s already too late to avoid war. We are where we are because we did not deal with North Korea decades ago. Diplomacy and sanctions are not going to work. And it is not feasible for us to live with a nuclear North Korea. No matter what we do now, there is going to be a lot of pain. Nikki Haley says that Kim Jong-Un is just begging for war. Why yes, they are. America is poised to step into a carefully planned military trap laid not only by North Korea, but by China and Russia. If he can push the US into a first strike situation, the New Axis of Evil comprised of North Korea, China, Russia and Iran will take the high ground and accuse us of starting a world war. China and Russia will both back North Korea and we will be in a full-fledged hot war. This is the same conundrum we face with a nuclear Iran. For all those worried about South Koreans dying… as much as I feel for them, I’m with John Bolton on this one. How do you feel about dead Americans? Think about that because it is what we face now. Russia and China have already moved military assets into the area. There is no other way to interpret this other than a prelude to war. FDR once said (and I loathe quoting him), “When you see a rattlesnake poised to strike, you do not wait until he has struck to crush him.” North Korea and Iran are that rattlesnake. Trust me on that. The meeting this morning came about after North Korea conducted their sixth nuclear test. Their strongest to date. For the life of me, I cannot understand how experts are somehow perplexed over how fast the NoKos are moving militarily. It doesn’t take a genius to see the hands of Russia, China and Iran here. What’s more, we knew about it, so spare all of us the faux shock already. North Korea has now miniaturized a nuclear bomb to go on their ICBMs. Just yesterday, North Korea threatened the US with an EMP attack. Millions would die after such an attack as our power grid would get fried affecting just about everyone but the military and even they would be somewhat susceptible to that catastrophic move. What is even worse is almost immediately after that attack, China and Russia would surely attack us. We have no idea how close to a world war we truly are. “We cannot kick this can down the road any longer,” said Halley at an emergency UN meeting convened after the weapon test overnight Saturday. President Trump has also condemned North Korea in very strong terms. “North Korea is a rogue nation which has become a great threat and embarrassment to China, which is trying to help but with little success,” Trump said in one of several tweets Sunday. Defense Secretary Mattis has warned North Korea of annihilation. He said later in the day at a White House meeting that any threats by North Korea to the United States or its allies will be met with an “effective and overwhelming” military response. I’m sure that is true. I’m equally sure that North Korea doesn’t give a damn. Our next move will be economic sanctions against anyone doing business with North Korea. Those won’t bite either and the waltz towards world war continues. “When a rogue nation points an ICBM at you, you don’t take steps to lower your guard,” Haley said. Strong words from Haley, but I might point out that so far we have been entirely lacking in backing up our threats except for Syria. The red line keeps on moving and everyone keeps wondering who will strike first. I pity President Trump here. It is truly a matter of damned if you do and damned if you don’t.